Within the text below I will try to explain the various approaches to control scanners and point out the associated problems. With modern scanners connected to a computer via USB, the scanner is controlled from applications using two standards: Twain and WIA. Here is some background information. TWAIN is is a standard established in 1992 by Aldus Corporation, Eastman-Kodak, Hewlett-Packard and Logitech for exchanging data between image input devices (scanners, digital cameras, etc.) and applications for Microsoft Windows and Apple Macintosh. TWAIN 2.4, released December 15, 2015, consists of three elements: The data source, the application program and the source manager. The data source is formed by the scanner or digital camera driver. 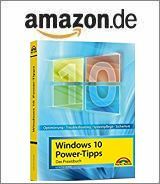 This must be supplied with the device in a version compatible with the Windows version or may be downloaded and installed at a later date from the manufacturer’s website. Then application programs such as PhotoFiltre etc. can be used to address the scanner directly and to continue using the image data of the scan. If this does not work, the device’s TWAIN driver may no longer be compatible with the existing Windows version. Here you can only try to uninstall the manufacturer’s Twain driver and reinstall a new driver or the old driver. This is the interface introduced by Microsoft from Windows Millennium (WIA stands for Windows Image Acquisition). Windows Fax and Scan as well as other functions of the operating system or application programs can use WIA to initiate a scan. In order to run the scanner under Windows, a WIA driver of the scanner manufacturer suitable for this operating system must be installed. Unfortunately, there is a large hurdle for older scanners. Microsoft has introduced the WIA 1.0 standard for Windows Millennium and also supported it under Windows XP. Starting with Windows Server 2003, Microsoft switched the model of the WIA service from Local System to Local Service. As a result, all older WIA drivers no longer work under newer Windows versions. This was first noticed on a wider front with Windows Vista, later with Windows 7 and subsequent versions. I had explained this in more detail in my German blog post Scanner unter Windows 7. Scanning via this interface is not possible without a WIA driver adapted to the currently used Windows version. The scanner is then simply dead. If there is no updated WIA driver, you can only try to scan via the TWAIN interface. The software Vuescan, occasionally suggested, uses this interface according to my information. Meanwhile there are a lot of multifunctional devices on the market, consisting of printer, fax and scanner including network connection. An elegant trick is actually used there: A network share is set up on a computer within the network, on which the scans can then be stored. The multifunction device is then set up to automatically store the scans as files on this network share. Basically, you only need to configure the network address (URL) and the access data (user name and password). The concept is, because of the access to network shares, independent of the used operating system. What looks ingenious in theory proves to be a great evil in practice. When searching the Internet, you very quickly come across calls for help in forums, claiming ‘scan to network folders’ no longer works after any update in Windows 10. The HP Forum contains several articles (German entry, some English hit is here about All-in-One printer series). At hardwareluxx there is an entry here. These postings are all in German, but you should be able to find other posts in English. In Windows 10 V1709, Microsoft has decided to discontinue support for the SMBv1 protocol. Systems on which the protocol is still installed will retain it. But since Windows 10 version 1709 (Fall Creators Update) there is a dirty trap: Windows 10 checks if the SMBv1 protocol is used. After 15 days without using the SMBv1 protocol it will be uninstalled via DISM command (Susan Bradley pointed this out here some time ago, but Microsoft has also explained this in this KB article). When scanning to a network share there are then the strangest error messages. Everything from error code 0x80004005 to other messages is included. Here it only helps to reactivate the SMBv1 protocol for test purposes under Windows 10. 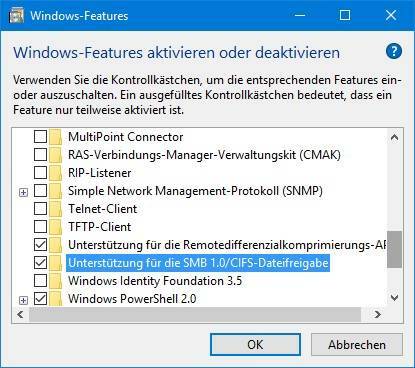 I had outlined this some time ago in the German blog article Windows 10: Kein Zugriff auf Freigaben already in another context. 1. Go to control panel (type ‘control’ in Windows 10 search bar and select control panel entry) and invoke Windows features. 2. Then, in the Windows Features dialog box shown above, enable support for SMB 1.0/CIFS file sharing option (check box). Once OK is confirmed, Windows must restart. When rebooting, SMBv1 is added to the operating system and scanning to network folders should work again. After switching to Windows 10 April Update (version 1803), the forums have seen a series of users who can no longer scan multifunction devices. The common feature is that Samsung Easy Document Creator is used for scanning. I have received requests from Facebook, Microsoft Answers etc. Scanning with Samsung Easy Document Creator is described in more detail on this HP page (German) or here (English), for example. Windows 10 and Samsung Easy Document Creator, now offered by HP, have been a source of trouble in the past. During the “Scan to PC”, messages such as’The current process has failed’ were displayed. Or an error message like the following will be displayed. For example, the HP forum now contains the thread After upgrade Win 10 v 1803 Easy Document Creator won’t comunicate with scanner from early May 2018, which describes the dilemma. The Windows 10 April update knocked out the software, the scanning doesn’t work anymore. Even the TWAIN interface is disabled. In this MS Answers forum post, a user reports that scanning with Windows Fax and Scan still works (WIA is used). A workaround is to use the software NAPS2 (Not Another PDF Scanner 2)) for scanning. This software can scan via TWAIN and WIA. I haven’t found anything at the moment, but Easy Document Creator might try to use the SMBv1 protocols for writing – and that goes wrong for the known reasons. Within this HP forum entry is a download link win10_rs4_patch_adding_pcfax-fix .zip mentioned that should fix the Easy Document Creator. Within this Microsoft Answers forum thread I posted a link to this korean forum. There is a download link for hotfix_usb_win10_v1803.zip. I briefly checked both downloads – the files are signed by HP (until May 30, 2018). However, I can’t test if the hotfixes enables the scanner. Addendum: There is a final fix, see Windows 10 V1803: Easy Document Creator scan bug fixed. Right click the Epson scan icon and select the context menu command Run as administrator. 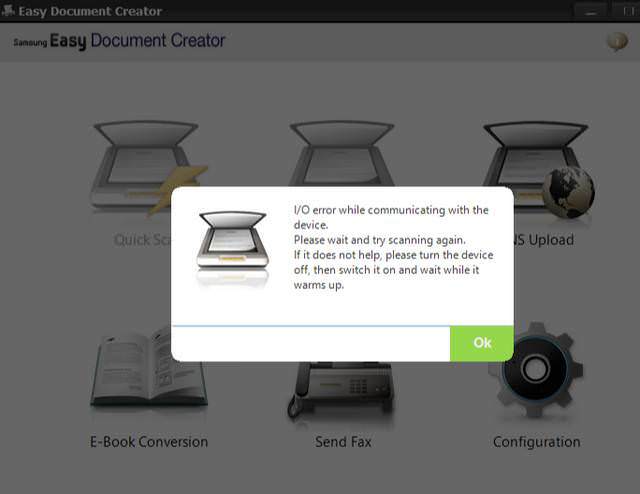 It’s not the best solution, to run the EPSON Scan Utility with administrative credentials. It’s probably possible to use a graphic program with Twain support for scan, until Epson provides a fix. This entry was posted in issue, Update, Windows and tagged issue, Scanner, Update, Windows 10. Bookmark the permalink. This patch fixed the I/O error after windows 10 update for me. Le correctif fonctionne pour Easy document creator de Samsung. Merci. This patched fixed the problem for my Samsung Multi Function printer MFP M 2880FW. Problem started after applying patch in beginning in June 2018.